Showering is a straightforward act but these showers take it a whole other level. I thought the shower I encountered in Singapore was mind-boggling. I found out later my experience wasn’t the strangest one yet! If you have family members who spend too long in the shower, this shower curtain may be your answer! Elisabeth Buecher designed the Spiky shower curtain to address water wastage. The way the curtain works is that it inflates after 4 minutes. The inflated spikes will cause the shower space to be cramped and uncomfortable to shower in. I have a feeling by the time I find the right water temperature, I’m already kicked out! The horizontal shower looks like something from a sci-fi movie but it’s an actual real-life design. This is the dream shower for those who are lazy or those who are looking for a bathtub with minimal cleaning. I have a feeling when the shampoo and body wash come into play, it’s going to be a slippery situation. On the other hand, I might save water because everything will rinse off fast. However, I still have some questions: Do I lie down or sit? How do I get in? Not all of us have the space to install a horizontal shower so the alternative solution is to install multiple showerheads. The upside to this is the opportunity to buy more than one favourite shower head from the store. Don’t need to decide on one when you can choose maybe four! It’s a bit like choosing handbags and shoes to wear. Monday rain shower, Tuesday the shower on the right, Wednesday the left shower, Thursday the jets…use ‘em all on Friday to Sunday! Squeaky clean in half the time. For those who want to take showering adventures up a notch, try getting multiple showerheads with strong jets installed. This is like a carwash or a decontamination shower, though I’m not sure how to remain standing in the shower while being bombarded from all directions. The plus side of this is it gives a strong body massage. This was sort of my experience in Singapore but my problem manifested itself in just one knob with no inkling whether to get lukewarm water. There was also the mysterious red button that did nothing significant (maybe it was spoiled). Now, if one knob can masquerade as a Rubik’s cube, imagine looking for the right knob when you have more than two on the wall. It’s a toss-up of Rain of Fire or Blast of Ice. It’s a shower roulette. What do the other knobs do though? 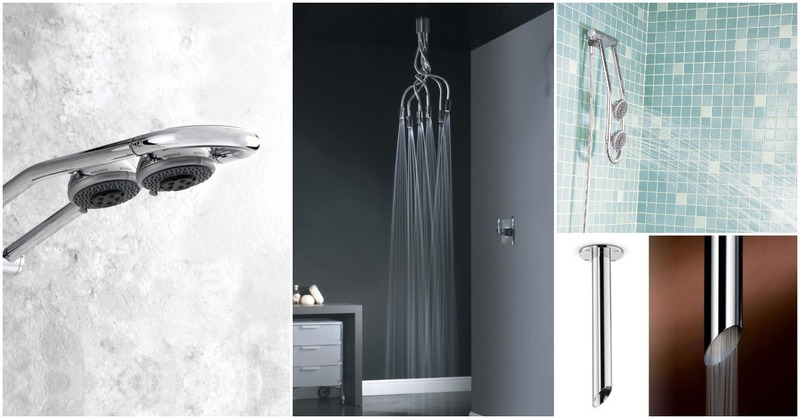 Reclining showers seem to be the path to revolutionize our ordinary showers. The Japanese-made Avant Santelubain 999 acts like a washing machine but it not only cleans and dries you, it also pampers you with aromatherapy, treat you to a seaweed wrap and moisturizes your skin. The pod self-cleans too! This makes it way better than the reclining shower above. 5 Devious Ways To Trick Your Small House Into Looking Big!